I first visited Clifton Gardens in the mid-1960s when the junior rugby league football club that I played for regularly held their annual end of season picnic there. Clifton Gardens was then an old time picnic ground (it opened on Christmas Day 1863), with a wharf, bathing enclosure and shelter sheds being the most prominent features. There was even a dancing hall and skating rink! The shelter sheds are now gone (perhaps they were the remains of hall and rink) but the local council has spruced the area up and it is an excellent place for families and groups to picnic. The bay that it is located on is called Chowder Bay. The water is shallow and, of course, protected inside the shark net enclosure. Clifton Gardens has an number of dive sites, all which are excellent sites for beginners but like a lot of other harbour dive sites, they are a bit too easy and not that interesting for experienced divers in the day-time. One of these sites is Chowder Bay Wharf. Located on the northern side of Sydney Harbour just around from Bradleys Head and Taronga Zoo, Chowder Bay can be accessed via the Clifton Gardens picnic area off Bradleys Head Road at Mosman. Turn into Thompson Street (the last street on the left before the Zoo and Sydney Harbour National Park) and then (almost straight) into David Street. A hairpin turn at the end of David Street brings you into Morella Road, Clifton Gardens. The picnic grounds themselves are at the bottom of the winding road that comes off Morella Road about 50 metres from the hairpin. An large parking area is provided and at night or late evening there will be no problem finding a spot. However, note that Mosman Council charges an exorbant fee for parking (on weekends it is $9 for just 30 minutes - covers up to two hours - and even more for longer) and you get absolutely no facilities other than some dirty toilets (well there is a new block now, but this is what they used to be like) and the shark net (which has dozens of huge holes in it). There are not even barbecues that councils on the southern side of the Harbour provide free. However, at night (after 8 pm) you do not need to pay. When you get to the parking area, get out of your car and walk across the grass towards the Clifton Gardens swimming enclosure. You will see off a little to your left a series of large buildings, wharves and other structures. This used to be the Royal Australian Navy's Submarine Miner's Depot. This was built originally in 1891 as a base was built for the Submarine Mining Corps. The Corps was given the task of protecting Sydney Harbour, probably from the Russians. Note that the fortifications on Bare Island were opened also in 1891. Anyway, the protection of the Harbour was planned using mines attached to cables that ran along the bottom of the Harbour across to the other side (probably to Green Point). The mines were designed detonate if an enemy ship entered the harbour and hit the mines. The buildings contained barracks, boatsheds, wharves and explosive storage areas. The Submarine Mining Corps was shut down in 1922 and the Chowder Bay base became a depot and barracks for Army engineers. From the 1940s it was used for the Army�s Maritime Transport Wing (I remember seeing lots of Army Ducks there). In the 1970s it became the Army Maritime School until it was moved to Townsville in 1997. It lay unused from then till 2001 when the area was passed over to the Sydney Harbour Federation Trust. Most of the buildings remain, as do the wharves. The dive site is the wharf on the southern side of the buildings, not the larger concrete piled wharf fronting the Harbour rather than the bay. An alternative access (an much cheaper option) is via the road to Georges Head and then to HMAS Penguin and then follow the signs to Chowder Bay. Go straight ahead at the roundabout and drop your gear here before going back up the hill till you find a parking spot. Note that you have to pay here, but it is much more reasonable and if you have a NPWS pass, you can park a bit further up the road for free. After gearing up, walk down the stairs in front of you and then to the left. Then take the stairs down beside the restaurant and you will be near the dive shop. Open the gate ahead (it is normally just closed during normal hours - not locked) and go out onto the wharf. You will see a set of stairs down on the right and a ladder on your left as you walk out. Note that you may need to get approval from Plunge Diving to use this access. 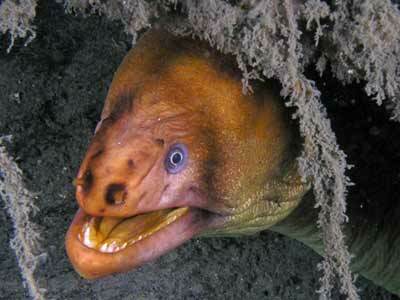 You will be then approaching the dive site from the opposite direction. Anyway, gear up and walk out along the Clifton Gardens Wharf which is on the left side of the swimming enclosure. Near the end of the wooden structure, part of the wharf steps down to the water level. An easy giant stride and you are in the water. When you get to this, take a bearing on the Chowder Bay Wharf with your compass. 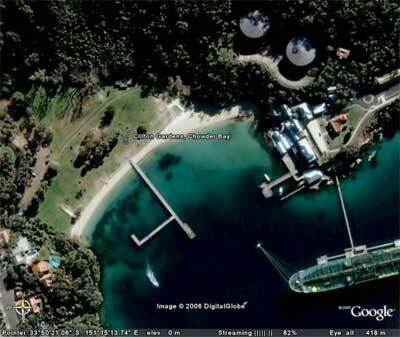 Drop off the end of the wharf and swim across the sandy bottom to the Chowder Bay Wharf. There are a number of objects on the bottom that you may encounter. There are a number of anchor chains for the warship mooring dolphin located between the Clifton Gardens Wharf and the larger concrete wharf. These chains have links the size of flattened tyres and they run out in a number of directions from the mooring. These should be examined as I will explain later. The depth gets to 11 metres or so. The chain is home to some of the most interesting things you will ever see. Once you hit the chain, follow it to the south and look on the sand beside the chain as well as under it. 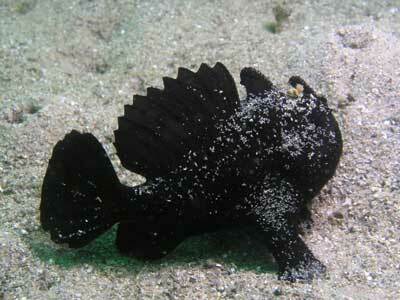 You may be lucky to see anglerfish. 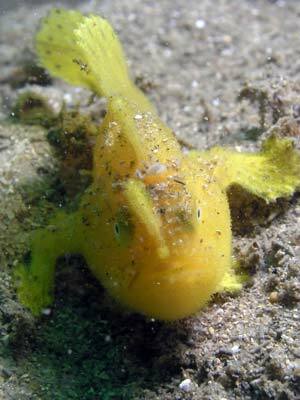 On a dive here in late January 2008, I found two tiny 25 mm long anglerfish (one yellow, one black - see photos below) and my buddies found another tiny yellow one and a larger coloured one. In January 2010 I found a black one. Follow the chain till you come to the buoy (this is clearly visible in the photo top right) and you can hear it as you get close as the chain rattles. There are two other legs of the chain, one heading just south of west and the other north-west. Follow the west one and it curves to the south. About five metres along here I found the yellow anglerfish right next to the chain. After about 20 metres you come to another chain that crosses this one at almost right angles. Just past here there is a huge timber pile laying at right angles to the chain. Keep following the chain and it turns more and is now almost heading south. About 15 metres on you come to the huge anchor that holds the chain and buoy in place. There are also some wire mesh structures and a few boat anchors that are tangled up in them. Note that in June 2011 the chain appears to have been lifted (perhaps by the Navy) and is a bit different than before. Follow the chain back towards the buoy. About 10 metres back you will see the faint outline of another chain running at right angles. Turn right and head to the south (roughly). This leads to another large anchor. There are some other things along here, including some boat anchors. At the end of this section of chain are two boats. The first one is a 28 or so foot yacht. You can go inside it and see the engine and some other things. There is an aluminium scuba tank in here. Written on the neck is something like "Failed". Seems it was put here by Plunge. Off the stern is another wreck. This is a small launch, probably 25 feet long. You can either follow the chain back to the main chain and the buoy or you can head off east. If you go east, try to keep at about 14 to 15 metres. After about 40 or 50 metres you will hit the main ship refuelling wharf. This has some huge pylons. There are normally seahorses under here as well. Off to the north-west there are more items of junk. There are lots of cage like structures, triangular in shape and long. If you continue you will hear the chain on the buoy get louder. If you find another large open boat, then this is within about 20 metres of the buoy. Follow the triangular cages and you will see the buoy. If you decide to go back from the two boats, head back to the north and when you see the pile, cross over and examine the length of it. When you come to the other chain, you can head down one bit and then up the other if you like. Once back at the main chain, go back to the buoy. Now take the north-west one. 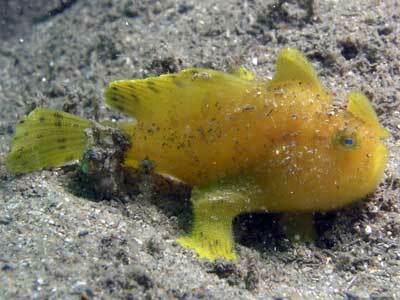 I found the black anglerfish about 10 metres along and there was later another yellow one almost next to it. About five metres on was the larger one. This chain goes for a while and has other structures at its end. Return back to the buoy. Head north up that section of the chain and after about 25 metres, head east. This will take you to the wharf. As you get close to the wharf, you will come up to about six metres and start to see some other timber items. Some appear to be old parts of the wharf and piles and another is the boat carriage from the slipway that runs next to the wharf. Once you hit the wharf area, follow the outside pylons on one direction. Once you have been around in a complete circle, exmaine the centre part of the wharf. There are also more bits of old wharf and other items under the wharf. I had expected to find sea horses on the pylons or kelp under the wharf but I have not seen any. However, there are lots of other things like huge numbers of small yellowtail, bream (including some large ones) and luderick. 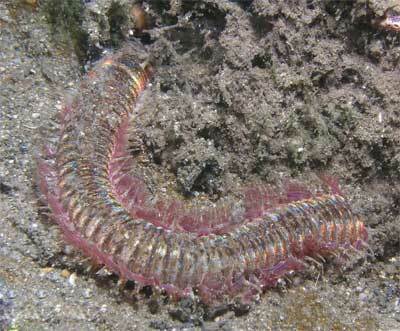 You may also see things like anglerfish, blue-ringed octopus, pipefish, decorator crabs and the similar. To the south of the wharf there is a large timber boat, a very large Admiralty anchor and even a LandRover. Explore out a bit to the south-west, south and south-east before going back to the wharf area. Once you have finished exploring, head back on the opposite bearing to the one you came over on (perhaps a little more to the west for safety). When you hit the Clifton Gardens Wharf, turn right and follow the wharf till you see the swimming enclosure. Examine each pole and the net along the way as you are certain to see sea horses on many of them. 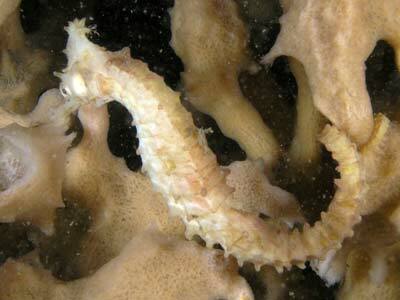 These are mostly White's seahorses, also known as the Sydney or common seahorse although you might see some big-bellied seahorses. You can go through some of the huge holes in the net and look at the abundant fishlife on the inside, but more likely as you have spent time over on the other wharf, you should just follow the outside right back to the beach. 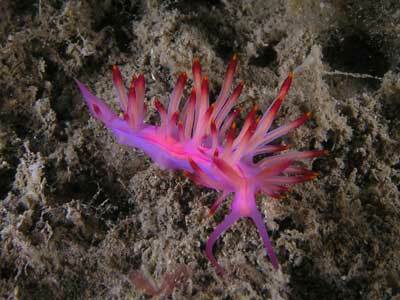 A great deal of the attraction of this dive is the macro life that is abundant under the wharf and bathing enclosure. 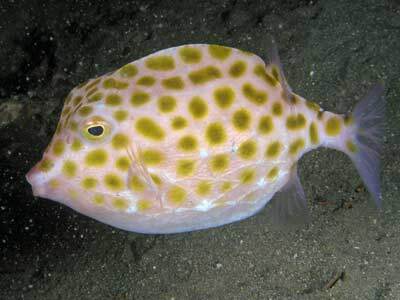 Ideal for macro-photography, things to look for include cuttlefish, lined-dumpling squid, prickly and pygmy leatherjacket, moasic moray, crabs and small octopus. Other fishlife to be found here includes estuary catfish, snapper, bream, old wife, snakeskin and senator wrasse, rough and yellow-finned leatherjacket, blackspot and blue-spotted goatfish as well as black sole. 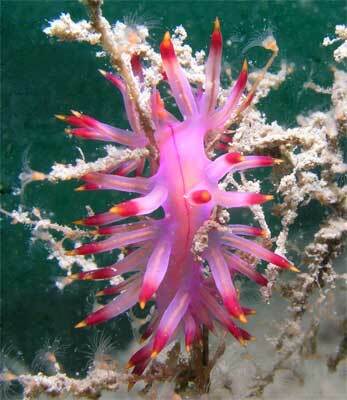 If you look carefully on the pylons you will see the incredible decorator crab. These crabs look like sponges as they have large sponges growing on their shells. You will have to look very hard to see them. 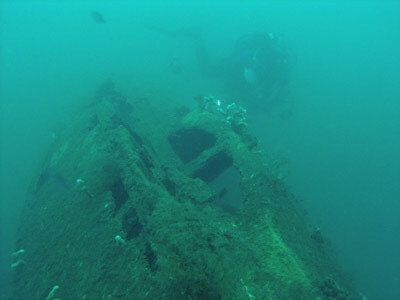 Because of the shallowness of the water on this dive, it is preferable to dive this site at high tide and if you are a bit light on lead, you might add some weight to keep you down at the end of the dive. 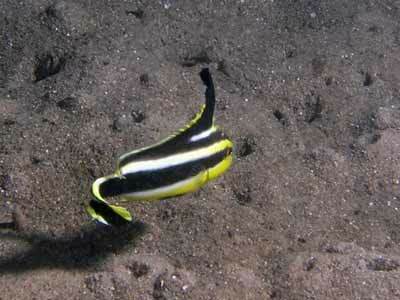 At low water there can be as little as 2 metres of water over a large part of the dive route. 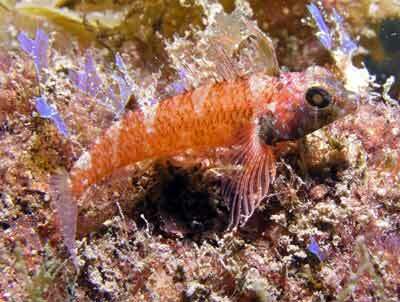 Visibility is never very good on this dive, although you may get as much as seven metres. A good night dive, which could also be not a bad day dive except for Mosman Council's exorbitant parking fees.